You’ve never seen anything given such a wide berth in a straight line race as this drag bike. Phil the photographer is gesticulating frantically to get us closer together for pictures, but it just ain’t happening. Just hearing the thing run made me want to go and hide in the van. Watching 260bhp spinning up the rear tyre at 100mph as owner Rob fought to keep it in a straight line had us all backing away nervously. His solo (we all ‘lost’ the keys to our bikes) drag runs at Bruntingthorpe were some of the slowest his bike’s ever done thanks to a massive lack of grip compared to the drag strips it’s built for. And he still smashed all of us with a 9.93 second quarter mile. With the boost turned down. Whereas the other five bikes all had victories somewhere over each other, like the KTM being fastest to 10mph, the Hayabusa turbo was faster than everything, everywhere. When we looked at top speeds, the ZX-10R ran out of gearing at 173.9mph, the R1 ran out of puff at 181.3mph and the ‘Busa hit the rev limiter in top at 181.8mph. The mighty ZZR1400 took top speed honours with a solid 183.8 mph and we were dancing about celebrating until we looked at times. 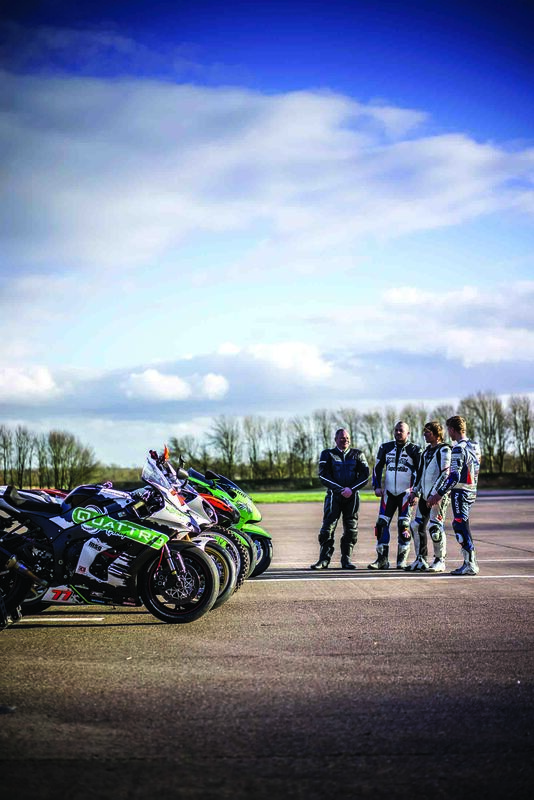 The Kawasaki 1400 took 28.7 seconds to get to its top speed, the ZX-10 race bike took 17.8. So what? Well, the turbo Hayabusa got to 181.8mph in just 14.7 seconds. When the drag bike is doing 100mph, the ZZR is only doing 87, when it hits 180mph, the ZZR is dawdling along at 165. When something makes a bike like the ZZR look that slow, you definitely need to give it a wide birth. And if anyone tells you that riding a 260bhp bike sideways at 130mph is boring, nail their pants to a rocket and fire it at a pack of angry lions; see if they find that boring too. It was definitely a day of surprises racing this motley crew of bikes down the runway. Nobody expected the KTM to be as quick off the line on dirt as it was on the tarmac and certainly we didn’t expect the Diavel to give the sports bikes quite such a hard time. We did expect the drag racer to be fastest, but not one of us realized quite how much of a handful it would be. I have definitely been guilty of suspecting drag racers of being a bunch of money-waving straight line merchants, racing in a formula where it’s only the bike that makes a difference. When we saw Rob grappling with the ‘Busa all the way from 0-150mph nobody said anything. We just stood open mouthed, dumbstruck and waiting for the first person to swear. Do yourself a favour and go watch at least one drag race in your life. Of the less ridiculous bikes, it was the Diavel that made the biggest impression off the line. The only road bike faster to 60mph was the ZZR and that took a careful balance not to fry the clutch or rear tyre. The Ducati took our abuse all day long and was the easiest to get off the line and the most consistent. In a real life, unprepared traffic light GP, you’ll struggle to beat it. If you’ve not tried one yet, get a test ride booked, grab some brown shoes and an open face lid and go bait some sports bikes. Seat height: Lower than low.